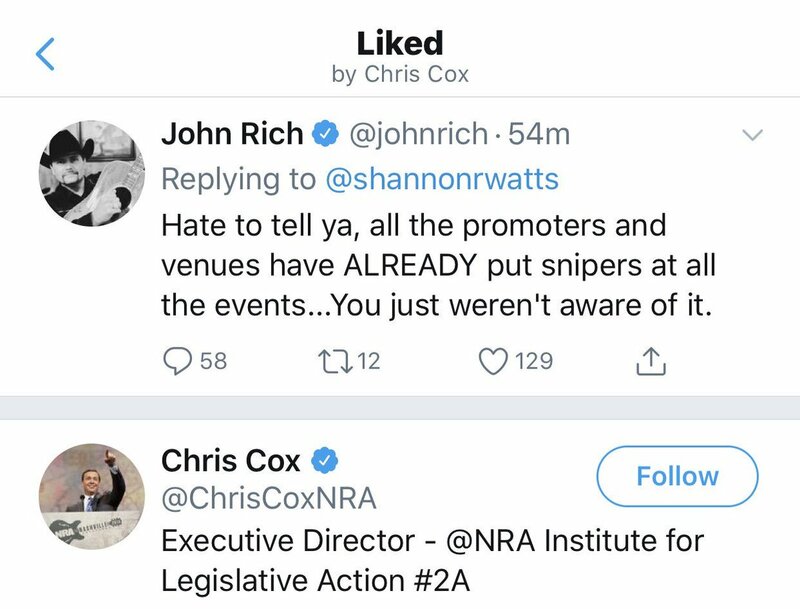 Thread by @shannonrwatts: "Chris Cox, head @NRA gun salesman, thinks Big & Rich’s “snipers everywhere” idea is lit. .@ChrisCoxNRA: Please clarify - do you believe […]"
Chris Cox, head @NRA gun salesman, thinks Big & Rich’s “snipers everywhere” idea is lit.
.@ChrisCoxNRA: Please clarify - do you believe we need both armed civilians everywhere at all times AND sniper teams at all public events? Also, how would a sniper team have helped in Vegas? They would have been firing into a heavily occupied hotel. Thanks in advance. NRA is still at it. in a race that could decide control of the Senate. Hawley’s campaign employs the same people to produce ads as the NRA Political Victory Fund. The NRA PVF has spent $1M+ on behalf of the MO GOP AG'S campaign against Sen. Claire McCaskill. The overlap in personnel is strong evidence of coordination between the PAC & Josh Hawley's campaign. - Brendan Fischer, dir of the fed reform program at the Nonpartisan Campaign Legal Center. 1. Think back to this time three years ago. Three years. That's all. Three short years. Now imagine people leaving @UKLabour because they believe it has become an institutionally racist party. You can't, can you? That's the scale of what's happened inside such a short time frame. 2. Now imagine how you can reverse that process. Right now when with the possibility of an election, when the leadership needs to avoid splits & rows, right now is when it CHOOSES to formally discriminate against Jews, to make anti-semitism conditional and get away with it. Why? Pay party and their corrupt practices. And you must see how so many things are linked. And at the centre, time and time again the NRA come up. Checks. Reagan, a firm believer in the right to bear arms urged Congress to enact the Brady Bill. Around this time, there was a massive change in the direction of the #TheRepublican party, coincidence maybe, but the GOP began to blatantly be seen as the Guardians Of Privilege.